Highly recommended. All my team have a copy. "Susanne's book clearly demonstrates the insights and tools to become an inspirational leader as well an intelligent manager of projects. Highly recommended. All my team have a copy. I'm that confident of the effect it will have on my business." – Paul Daniels MD, Leadership and Management Ltd. This book should be your personal development tool for this year! For projects to succeed and have lasting impact, project managers must be able to strategize, innovate, motivate, empower and collaborate - in other words, project managers must learn how to lead. 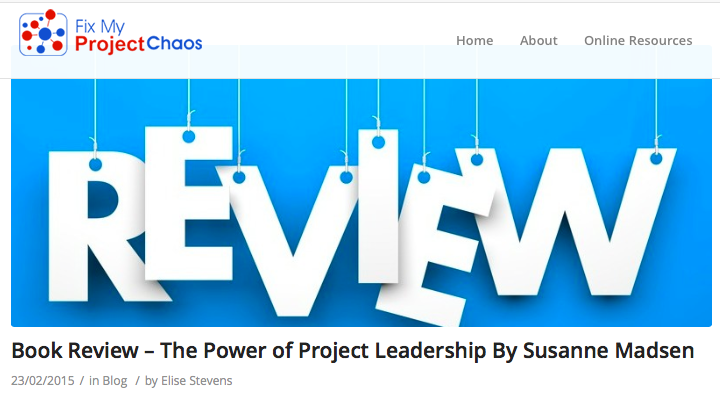 The Power of Project Leadership - helps project managers to transform into effective project leaders by shifting their managerial and task orientated mindset into one of inspiration, motivation and collaboration. It teaches them how to feel more confident and assertive, handle conflict and poor performance, build a team of critical thinkers, and be comfortable taking risks and standing out as a leader. The book describes what good project leadership looks like and explains how to make the transition using concrete tools and strategies. With underlying theories to help the reader understand how teams and individuals are motivated, it ensures that project managers lead with vision, continuously improve and innovate, work with intent, empower the team, get closer to stakeholders, remain authentic and establish a solid foundation for their projects. The book has a practical and engaging approach and references over 25 interviews with leading project management experts and thought leaders who themselves have made the transition from project manager to project leader. These experts come from a variety of sectors and companies; including Expedia, British Gas, Standard Bank, Verizon Enterprise Solutions, and the UK Government. The Power of Project Leadership has also been translated into Chinese! Read all the endorsements here!